ww2dbaseThe P-36 Hawk fighters were designed by Donovan Berlin as a private venture of Curtiss. The prototype flew in May 1935. 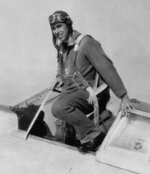 Curtiss was awarded with a contract for 77 aircraft in 1936, and in 1937 United States Army Air Corps ordered another 210. The first Hawks to enter service were sent to the 20th Pursuit Group at Barksdale Field in Louisiana in Apr 1938, where numerous problems were discovered successively, rendering these fighters to training and other rear area roles. During the entire war, the only action they participated under the American banner was the attack on Pearl Harbor, where four of the 39 deployed at various bases in the area were able to take off and were credited with two kills. Outside of their home country, however, Hawks saw more combat time. 291 of them made their way to France beginning in Dec 1938, and they produced 11 French aces. After France fell under German control, many Hawks flew against British and American aircraft in North Africa; during Operation Torch in Nov 1942, 7 American aircraft were shot down by Vichy French Hawks. Via Germany, 44 captured French and Norwegian Hawks were transferred to Finland and produced a number of aces during Finland's war against Russia as well. A few Hawks served under the British banner under the designation Mohawk, although, like their American cousins, the Mohawks were not heavily used. 7 Jul 1937 The USAAC placed an order for 210 Curtiss P-36A fighters, which was the largest US peacetime contract ever awarded for fighter aircraft up to that date. 1 Oct 1938 The 16th Squadron of the Chinese 6th Bomber Air Group was converted to become a fighter squadron, flying Hawk 75 fighters. It was to be based out of Zhiqiang, Hunan, China. The thirty-nine P-36A aircraft stationed on the Hawaiian islands at the time of the Japanese attack on Pearl Harbor belonged to the 46th and 47th Pursuit Squadrons (The latter being in the process of converting to the P-40 at the time). It was aircraft from the 46th Pursuit who achieved the first AAF kills of the Pacific war.